On 6th January 2015, Indian Regulator, TRAI, has finally recommended a reduction in Universal Service Obligation Fund (USOF) levy from 5% to 3% of the annual adjusted gross revenues. This has been done due to low level of utilization of collected funds. It notes that in ten years, out of the collected equivalent of US$ 10 Bln (approx), US$ 5.7 Bln remained unutilized, representing 57% of the USO levy collected. It is a well-known fact that telecom operators, all over the world, resent this “contribution” as they see the money either going to other sectors or – in worst case – simply down the drain. Cellphone operators (who are the major contributors) also resent the money going to other branches of ICT sector. Although now-a-days the situation has changed for the better as a lot of these funds are going into rural optic fibers, which are needed by the Cellphone operators for backhaul of mobile broadband! Several respected experts agree with the telecom operators, for a variety of reasons – admittedly they are not wrong. Like my good friend Rohan Samarajiva (lireneasia.net), says, “Where there is cheese, there will be rats”! And Ricardo Tavares (techpolis.com) thinks that over time the collection becomes an ordinary tax, not a fund, and does not return to the telecom sector. The GSMA study, in it’s ‘Key Findings’, recommended that the governments should “consider” if USFs are appropriate and relevant. Personally, I had an issue with that recommendation. 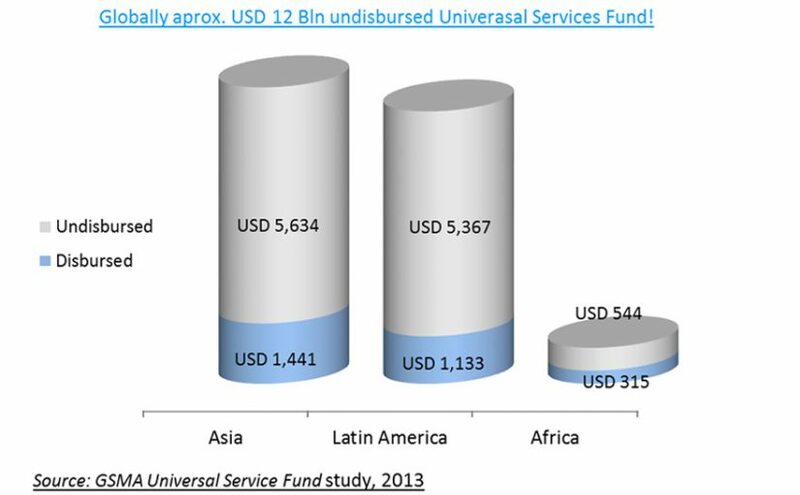 In my blog (I have a problem with GSMA) I argued that instead of implicitly advocating cancelling of universal service funds, GSMA should try to help the countries (who are all developing countries) so that they are able to utilize the funds effectively and efficiently. In the GSMA Report, one of the largest ‘culprits’ mentioned was India with billions of dollars lying unused. During my own research for my blog I talked to the head of Indian USOF, Mr. Ravi Shankar, whom I met at a conference in Zanzibar. He explained to me various plans that they had for spending the accumulated funds – mainly their flagship project “National Optic Fiber Network”. But apparently the speed of disbursements has not been up to that level! On top of that the India is special in any case, because it has one of the highest USF levies in the world – Five percent! Therefore it appears to be good step that they have recommended to bring it down to a more reasonable level. 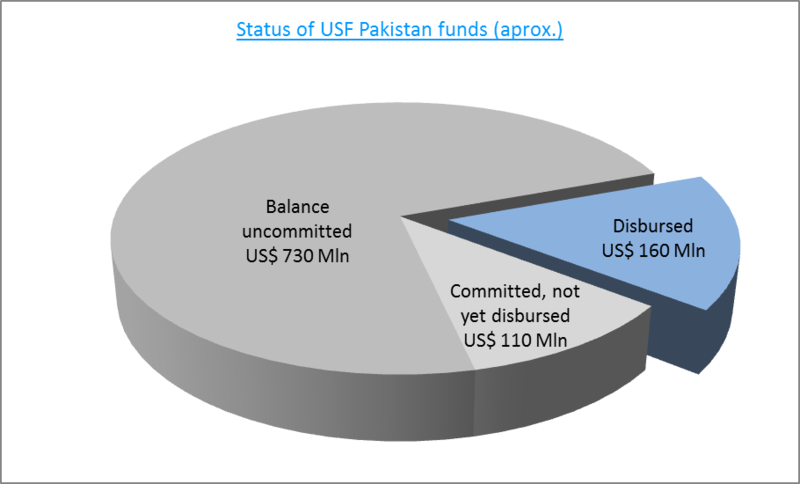 Coming to home, the level of utilization of USF funds in Pakistan, at this time, is actually worse. According to a careful estimate, since 2006 an equivalent of US$ One Billion has been collected (including the interest earned on the collections) – excluding those millions that were collected by PTA in the initial years and deposited directly with the government. Out of this One Billion, US$ 160 Million has been disbursed to the telcos. Another US$ 110 Million is committed in signed contracts of on-going projects, and is lying with the Government of Pakistan. The balance, equivalent to US$ 730 Million, is also lying somewhere – unutilized, uncommitted. This is not a small amount. It is equal to 0.3% of Pakistan’s 2013 GDP (which was US$ 232.3 Bln, as per World Bank data)! Since the USF collections are now being diverted to the Government (Federal Consolidated Fund), instead of helping the unserved areas, these are merely serving to fill the fiscal gap. 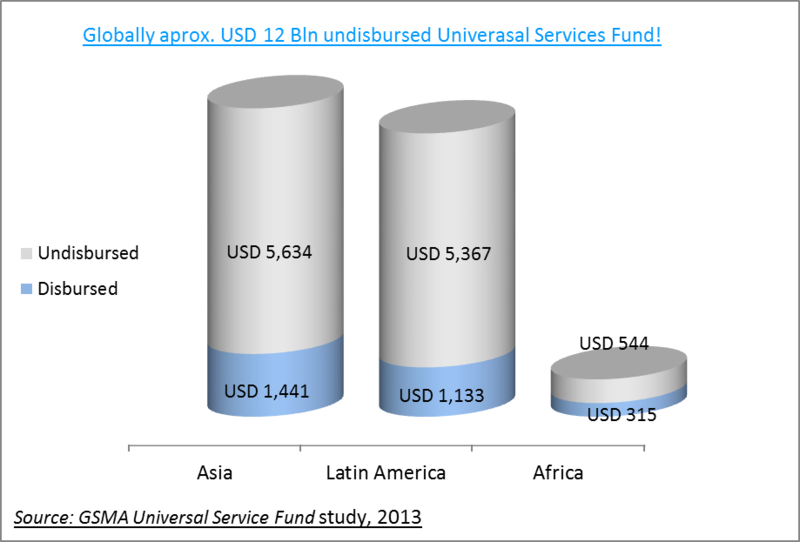 Does that raise questions if the USF levy in Pakistan (a very reasonable 1.5%) should also be brought down further? Perhaps even discontinued for the time being? In fact such a performance raises those same GSMA questions: Should there be any USFs at all? Should we not let the telcos deliver in the rural areas on their own? My personal experience says a big NO to this. Telcos are unwilling to go to most of those areas even with subsidies, leave alone without! So we have to somehow accelerate USF development projects and deploy ICT connectivity and services (real ICT services) in rural areas at a much faster pace – as was/is demonstrated by USFs in some of the developing countries. There are several international organisations trying to work on this – among them ITU, World Bank, USAID/GBI, CTO, etc. I work with all of them at one place or the other, and almost every time the question pops up if there is a better way of achieving the objectives. So far an answer could not be found. Till such time as we try to find that illusive answer, I think it is obligatory upon all of us to do our best to improve utilization of these funds as this still gives us the best chance to bridge that ever increasing digital divide – at least to an extent, if not fully.